This, my friends, is a cover. Oh boy, time for one of two really big books. Full disclaimer: I have read the book through at a scan level twice, and as the goal of the document is to be an introduction to Dungeon Fantasy in specific, and GURPS in general, it straight copies several elements from a lot of previous books. 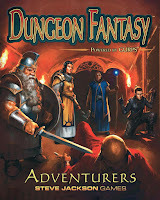 Namely, and most obvious and relevant, are Dungeon Fantasy 1, GURPS Basic Set - Characters, Dungeon Fantasy 3, and a little bit here and there from other books in the Dungeon Fantasy and other lines. So, if I missed something supremely important, feel free to let me know in the comments. With that out of the way, I feel like this is a pretty good surrogate for the aforementioned books, getting out only the rules that were absolutely necessary, and leaving the rest behind. Some of the stuff that was excised, although among my favorite mechanics (Namely, techniques, enhancements, and limitations,) I can concede that they may be a bit too much of a deep dive for an introduction to GURPS set, and that it took me many moons to wrap my head around them myself and appreciate the depth they can add. Let's take a closer look now. This is one of the two big books in the set, coming in at 130 pages; 19 of those are preamble and appendix including useful charts, character sheets, and example characters, leaving us with 111 pages of stuff. This book is largely mechanic and catalog oriented, and teaches players the basics of building a character, and allows them to purchase all the bits and pieces to make that come together. The real substantial rules explanation is in another volume, but this is the book of making a character, and spending points and cash to prepare them for the cruel reality of dungeon delving, and so, at least some explanation as to how some things work at a vague level is necessary to understand things like what it means to spend 15 points on Luck or Combat Reflexes, or throw it all into Broadsword skill, etc. etc. The Introduction, being especially long deserves a bit more attention than I usually give to it during other reviews. It acts as a kinda FAQ answering questions like... what you see in the sample screenshot to the left. 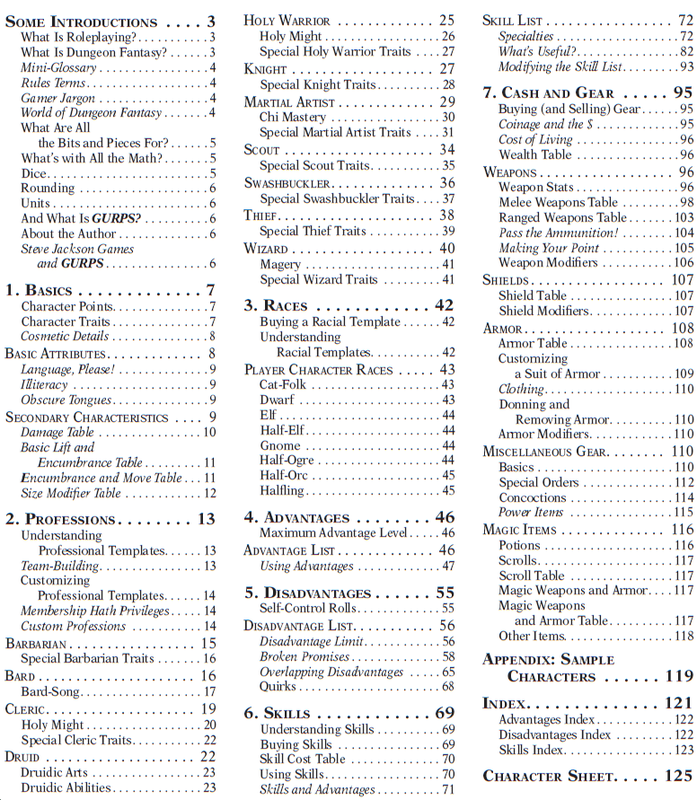 It also has a glossary, and some quick explanations of the most pervasive mechanics, terminology and jargon. At a meta-level, the book is laid out about as well as it might be; for some reason, I feel like the racial and professional templates (what some other rpgs might call your race and class) should go later in the book, but oh well. The art is phenomenal, grade-A stuff, and the trademark GURPS 4e styling is apparent throughout the book. One kvetch I have is that the example characters are laid out in a somewhat attractive style, but I feel like it would have been more helpful to include the information laid out on the character sheet. I noticed this because the first time I make a character in a lot of systems, I struggle to understand what information goes where; I think it also might have been good to organize the boxes on the character sheet a little better to give DR more space to account for the nominally 7 different hit locations most characters play with (but potentially more if one uses the special rules to, for example, wear different armor on the left and right arm,) and somehow shrink the Basic Move and encumbrance box a bit; certainly Parry and Block could have been significantly smaller. Reaction Modifiers and Languages seem a bit small (though Dungeon Fantasy does encourage a smaller list of languages, so maybe space for 3 is fine.) Likewise, the note section on the weapons section of the inventory is about big enough for my last name if I write small; might as well have knocked it off completely to give more room for the other bits. Oh well, it's largely compatible with any of several popular alternative online layouts or software tools meant for GURPS, so you don't have to worry about it too much; I have used the official character sheet a handful of times, and really, I find digital to be much more convenient, but that's not here or there, onto the next chapter. This section covers stuff like what are character points, what are the traits of a character, what details have mechanical meaning, and which are cosmetic. The chapter has improved in organization over the correlated chapter of Creating a Character in the Basic Set. This chapter includes the "Professional Templates" for the Dungeon Fantasy characters, 11 in total, with typical archetypes like casters, fighters, healers, rogues, etc. Dungeon Fantasy being a "point buy" system as opposed to being level based, lays out each template kind of like a menu selection. You have 250 points to spend, you choose a profession, and you get a few mandates and recommendations, and a few buckets to choose from, and when you are done, you have a character mostly built up. Compared to the original professions in Dungeon Fantasy 1, these seem to have bigger discretionary budgets (not sure if it is my imagination,) which allows for more easily purchasing an optional race found in the next chapter. The templates include advice for about three typical optimized builds each, and a selection of special abilities (that veterans might recognize as being a selection from Dungeon Fantasy 11 and various other resources) They use a lot more white space than their predecessors and two colors, which might make for some easier reading. Skills do not show their relative levels though, which might make buying levels of IQ, DX, or other attributes and secondary characteristics require some back and forth referencing of the skill section. GURPS veterans will note that any abilities that would include enhancements or limitations have them under the covers, but the prices are comparable to what one could create by themselves with the Basic Set. Finally, there is a lot of decent character building advice strewn throughout the chapter (really, all the Dungeon Fantasy books have them) in the Speaking from Experience asides. This chapter includes several of the racial templates from Dungeon Fantasy 3, 8 of them in fact. The list seems to have been curated to be those that are more affordable (no 50+ point templates) and those without exceptional social stigmas (eg the "evil" races) or considerable mechanical challenge (no SM-6 Leprechauns or Mana dependent fairies with 2 HP.) What we are left with are mostly interesting, and easily accommodated by the rejiggered racial templates without some of the hoop jumping that was needed in the earlier Dungeon Fantasy releases. The big point sinks beside attributes, the cool abilities that aren't skills. The list is a curated, paired down list from the Basic Set with a handful of innovations here and there from GURPS 4e's lifetime. The helpful descriptions for each advantage are noteworthy for being modestly revised to more obviously point out some of the important mechanical benefits relevant to a Dungeon Fantasy game, which I think is a nice touch. Similar to the Advantages chapter, but backwards. The chapter starts with some mechanics talk on Self-Control rolls, a concept that belongs to some disadvantages that occur at random intervals in the form of episodes to make them more or less likely, so worth more or less extra points. Every disadvantage you take gives you points back that you can spend on other things, in exchange for inconveniencing yourself. 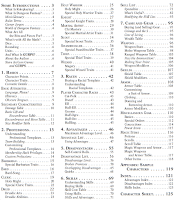 The chapter ends with a discussion of quirks; these are small roleplaying hints that act almost like disadvantages, and give a character an extra point for each; players are recommended to come up with a maximum of 5, but its optional, and it helps set aside your pile of numbers from someone else's and give you a coat of paint. All in all, the chapter organization makes as much sense as it could. Similarly to the Advantages chapter, this one is a catalog of things your character might be able to do well. The chapter starts with an explanation of mechanics like how much it costs to raise a skill level, and floating relative skills to other attributes, or using a skill at default: that is, attempting to fumble your way through something because there is no other choice, even though you don't know it well. The skill descriptions are helpful, and customized to be relevant to the sphere of Dungeon Fantasy, which is helpful even to me to see how some of the more periphery skills might have a benefit in a given situation. This chapter goes over money and equipment, as you might have guessed from the chapter name. It explains the interaction between the Wealth advantage/disadvantage and it's subtle influence on a character's ability to acquire funds and buy and sell, and then goes into equipment catalogs. The tables for weapons and armor have detailed explanations of all the attributes preceding them to help understand what you are looking at, and the equipment lists are fairly lengthy to give a decent variety of weapons and tools to new players. Weapons and Armor are moderately customizable with modifiers, a few unique to this iteration of Dungeon Fantasy, or maybe hidden well in a Pyramid issue I missed. Armor has a few options for making it more or less complicated that I can appreciate; it has pricing schedules to buy, for example, an entire suit of mail, or to buy it piecewise if that is your preference, or you are trying to save a bit of dosh. The chapter ends with several pages of items, mundane and magical alike. It is not a challenge to spend every last starting dollar you have. I'm surprised I didn't copy/paste my previous reviews, but I did seriously think it over. Really, the book is subtly different enough that it is warranted. That said, if you want more detail or depth on any given section you think I went over to fast, you might want to take a look at my reviews for the source/inspiration of those chapters. Overall, the optimization is positive for this book, and a lot of my complaints are longstanding ones. Sometimes, I worry that some things have been trimmed back just a little too much, but it might make for some low hanging fruit to be able to release a Dungeon Fantasy - Enhancements and Limitations or Techniques book if the line proves successful.